Elland WMC claimed the last trophy of the local bowls season with victory in the Halifax Association’s Brian Varley Trophy competition on Wednesday. They defeated Asa Briggs by 71-53 in the final of the Bluebird Care-sponsored event at West End. They were making it three trophy wins in quick succession following their defence of the Halifax League Division One title and their capture of the Halifax League’s Four-Man Team Knock-out Trophy. 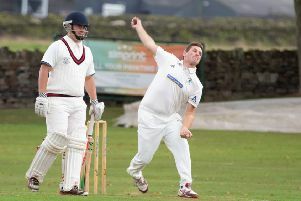 Elland were comfortable winners in their semi-final against Siddal, winning all four games, while Asa Briggs made sure of their place in the final by way of two emphatic victories against Stainland. Glenn McCafferty and Clive Foord won by 21-4 against Bob Morgan and Stuart Forster while Ashley Southwell and Stuart King were 21-9 winners against Mark Baron and Paul Hitchen. In the final, Ashley Southwell and Stuart King gave Asa Briggs an excellent start with a 21-8 victory against Paul Ingleby and Martin Griffiths but that was their only success. Robert Hitchen and Jack Dyson made up some of the lost ground as they came back from 9-13 against Andrew Heenan and Andy Denton to win by 21-13. Paul Demetriades and John Armitage made sure of victory for Elland with their 21-6 success against Myles Summers and Mark Pearson and James Senior and Robert Holmes won 21-13 against Clive Foord and Glenn McCafferty.